being MVP: SleepBamboo.com Sheets & Giveaway! 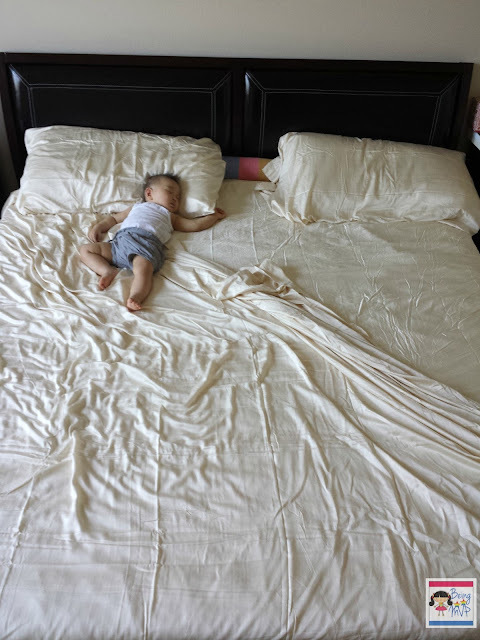 I love the silky smooth bamboo pillowcases from SleepBamboo.com so I was elated to receive a set of sheets for review. I chose the color Nougat and I love them. The king set comes with a flat sheet, fitted sheet and two pillowcases. The sheets are soft and silky but durable. Bamboo Sheets are awesome because they are naturally antibacterial as well as adjustable to your body temperature. This is a unique feature because I am usually hot all the time and it's nice to lay on cool sheets whereas Hubs is cold at night even though the room temperature is warm. They are silky smooth without being too slippery as other bamboo sheets I have tried. The pockets are deep and fit our thick memory foam mattress with ease - as noticed by our cleaner. The quality is fantastic as the fibers are tightly woven and the sheets wash well in the standard washing machine. Mason loves the sheets and has no problem taking midday naps with me on the weekends. "Bamboo textiles are very smooth, bamboo textiles have a natural sheen to the surface and they really do feel like silk textiles or cashmere. Bamboo yarn by nature is much finer than cotton yarn, we use the finest bamboo yarn which gives our product a very Super Light feeling and an incredibly Ultra soft feel, Our bamboo fabric is 320 thread count construction. (equal to about an 1000 thread count fine cotton sheet as bamboo yarn is much finer than cotton yarn) This is ground breaking in the bamboo sheet world and our fabric technicians have worked many years to achieve this." Buy It: You can purchase the King Bamboo Sheets for $159.99. Make sure to connect with SleepBamboo.com on Facebook and Twitter! One Winner will Receive a Set of Sheets! I would love to try the Bamboo Bath Towels! I would love to have two sets of the Bamboo Sheet & Towels Combo! I'd love some Bamboo Pillows to go with those sheets! I'd love a coordinating duvet and pillow shams! the bamboo pillows sound amazing! i could have used one of those omega's when i was pregnant!! :) thanks for the great giveaway! I would love to have the Queen Size Luxury Bamboo Pillow- they look so comfortable!! The Luxury Bamboo Pillows sound like dreams come true!! I really like their Bamboo Bath Towels in the light green color! The New Towels!!! What a treat that would be!! I would love to get the Bamboo Towel Set with Matching Tub Mat. I like the Kiwi Bath Towels! Omega Bamboo Body Pillow with Omega zippered pillow case included. I like the bamboo pillows. Thanks for the chance to win! I like the bamboo bath sheets in light green. I would like their bath sheet. The both towels sound great! The bamboo towels look great too! I like the bamboo towels. I would really love a set of the bordeaux stripe bamboo bath sheets! I like the Omega™ Body Pillow with Omega zippered pillow case included. The Queen Size Luxury Bamboo Pillows sound heavenly! Knowing the benefits of bamboo I would love to own the Bamboo Bath Towels. I would love to have any of their bath towels or bath sheets! the bamboo pillows look heavenly! i love the queen size duvet cover with shams! i would so love to have that! The Queen Size Luxury Bamboo Pillow is great. I'd love to try the bamboo bath sheets! A King Size Luxury Bamboo Pillow might be very nice! I would love to try the Bamboo Bath Towels! Thanks so much for the fantastic giveaway! Bamboo bath towel set with matching tub mat in cobalt ! I really love the King Size Luxury Bamboo Pillow. I think the towels look nice! I'd love a bamboo duvet cover! I also like the bamboo towels. I'd love to sleep with the Omega™ Bamboo Body Pillow. I love the Queen Size Luxury Bamboo Pillow. I like the 5 Piece Bamboo Towel Set. I would love to try bamboo towels. I would like the bath towels. I also like the duvet covers. Like the Bamboo Bath towels. A bamboo duvet cover would be awesome. I would like the bamboo towels in striped colors. I'd like to have the Bamboo Bath Towels. A little pricey but nice! I also like the bamboo pillows. I would also like the bamboo pillows because they sleep cooler. I love the bamboo towels. I also like the Bamboo Bath Towels. I like the bamboo towels! Thank you! I like the Bamboo Charcoal Soaps.